Purchased: MDRanking Myer Centre, Brisbane. First impression: Extremely practical packaging, it’s nice to see something green instead of the 50 shades of pink you usually get from Etude house. Falls somewhere in between a foundation and a bb creme. Not entirely certain if I’m using the best shade for my skin, but this was the only shade they had in at the moment. The finish is dewy and more or less moist, thus don’t use it on your forehead or nose if you have oily skin. The cushion is freaking exciting, because I’m that much of a nerd. Packaging: It’s packaged like a compact or your standard powder. The lid has a magnifying mirror on the inside that makes this product ideal for travel. It is refillable, which is welcome since it contains a relatively small amount of product. The sponge is dense and well suited for its task. The cushion itself is sealed into a special compartment that’s meant to keep air from reaching it and thus it’s protected from becoming a bacterial party house. Usage: Press the sponge against the cushion, dab onto face. 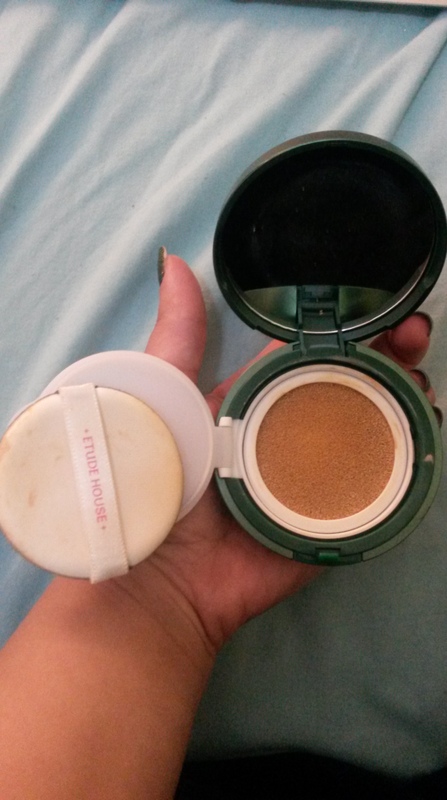 It’s pretty easy to use, but I’d recommend using some sort of powder on top of it in the t-zone to prevent it from looking oily. Can be used in simple layers or be built up for increased coverage. Adapts to your skin tone to some extent. Feels very lightweight and pleasant on your skin. Value for money: It’s a really good product. For a cushion it’s rather cheap and good value for your money. So if you think cushions are the bee’s knees, go for it. Massive plus for the high SPF. One of the most affordable cushion foundations out there. Would I purchase this again? I will probably need to look at the other shades to see if they are better suited for my skin. It’s a fantastic product for travel, so I will probably use this mainly when I’m going somewhere. It has become one of those products I use almost every day. I have a few other cushions to try but there’s a decent chance I’ll return to this one.